There is something powerful about revisiting the final moments of Jesus’ life as a human being. That’s what draws many Catholics to meditate on the Stations of the Cross. By looking at depictions of the 14 scenes from his death sentence to his burial and meditating on them, those who pray with the stations recognize that Jesus suffered, and that he understands human suffering. There is comfort and consolation in that. But knowing that Jesus died in reparation for our sins, while pondering Jesus’ suffering and death and resurrection we can take the further step of relating Jesus’ journey to life today in our own world, in our own lives. The following 21st Century Stations of the Cross invite this type of meditation. Whom does our society condemn? Whom do you condemn by not honoring Christ’s presence in all people? What crosses do you carry every day? How do you endure your suffering and challenges with grace and courage? What weaknesses cause you to stumble and fall under the weight of your burdens? Do you secretly ridicule others when they fall? What is it like to watch a loved one suffer and know there is nothing you can do to help? How might you better appreciate those who care about you? V. Simon helps carry the cross. When you are asked to help an unpopular person or cause, do you do so willingly or reluctantly? VI. Veronica wipes Jesus’ face. Can you overcome fear and peer pressure to be compassionate and gentle to one who is suffering? How do you summon strength and perseverance to carry on in the face of failure? VIII. Jesus meets some grieving women. Can you keep your burdens in perspective enough to empathize with the sorrows of others? How do you react when you see someone beaten down by repeated cruelty? What does it feel like to be humiliated and robbed of your human dignity? In what ways do people cause unbearable pain to others with their words and actions? When a part of your life dies, are you able to move past your anger and forgive? How well are you able to honor and embrace the inevitable partings in your life? How is an ending the beginning of something new? 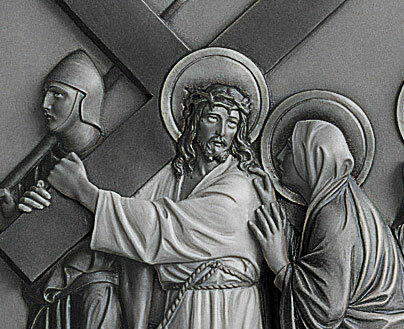 The 21st Century Stations of the Cross was written for Lent 2001 by Emilie Ast Lemmons, and first appeared in The Catholic Spirit, newspaper of the Archdiocese of St. Paul and Minneapolis. Lemmons, an award-winning writer, blogger, wife and mother of two young boys, succumbed to cancer in 2008 at the age of 40.